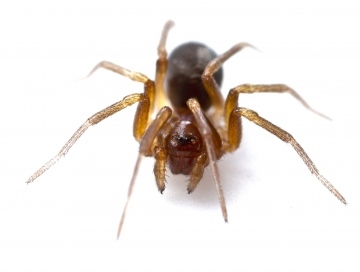 This is Steatoda bipunctata, a variable spider which is harmless to humans and widespread in buildings and gardens. Can you please provide a full postcode so that your record can be added to the recording scheme. 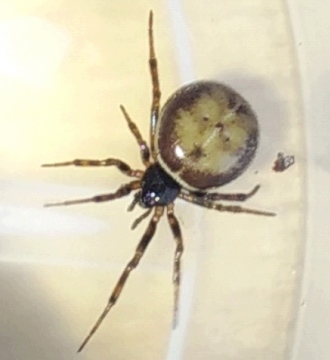 Please can someone help identify this spider - thanks in advance! Although the most likely species by far is Zodarion italicum, I assume you have already ruled this out. The best summary of Zodarion for Western and central Europe is in the BAS Bulletin, Bosmans, R. 1997. Revision of the genus Zodarion Walckenaer, 1833, part II. 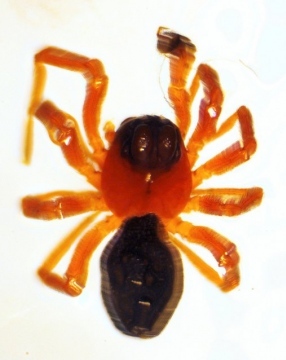 Western and central Europe, including Italy (Araneae: Zodariidae). Bull. Br. arachnol. Soc. 10 (8): 265-294. Z. vicinum is in the BAS Bulletin Snazell, R. & Bosmans, R. 1998. Zodarion vicinum Denis, 1935: New to Britain, and in newsletter 81 with figures, Newsl. Br. arachnol. Soc. 81: 8-10. There are figures of Z. fuscum in Askins, M. 1999. 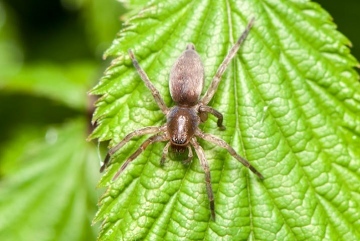 Zodarion fuscum (Simon, 1870): a spider new to Britain. Newsl. Br. arachnol. Soc. 86: 11. I can email these to you since they are not SRS News issues on this website. PS, if your Zodarion is not adult, you will not get to a species. Hi Peter, I will take this one to Tony this weekend. I have not seen a Uk zodariid before and I cannot do it from Roberts. Hypomma bituberaculum: 1 male, swept from plants on woodland path. Collected 19 May 2015. Locality: Pymore Fen in Pymore, ! mile N of Bridport. Site: VC9, Ref. SY469947. A small fen with a narrow woodland enclosing it on north side. A path runs through the wood and along a stream which feeds the fen. Michael Ackland. No, you had both pictures posted but then both together again, so they did not show. I sorted that out. Thanks Peter. I will post the data over the weekend. I was puzzled because the text and pictures uploaded to 'My stuff' OK, but not on the forum page at the time. I assume one has to wait a little time? 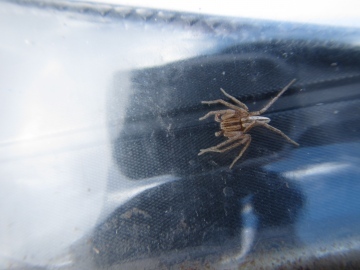 This is Hypomma bituberculatum, a wetland spider, see Hypomma bituberculatum page. We would certainly like details for the recording scheme, site name, grid reference, date etc. I submit a photo of the spider and two views of the male palp. I am not geared up to take 'normal' photos, only photomicrographs using a compound microscope. I have attempted a shot of the spider, which is 2.5-3mm long. I am pretty sure it is a Linyphidae species, and if so the palp is not figured in Roberts (1995). But in the restricted Linyphidae part there is a drawing on p. 347 of Hypomma fulvum, which shows the black abdomen and lighter carapace. My specimen also has the raised carapace as shown in tghe drawing, and the same number of eyes. I see this species occurs in fens, and I caught it sweeping for flies in a small fen near Bridport. Of course I have no details of the other species of this genus. I can provide further details of locality etc if it is necessary. It may be possible, but most likely not. It depends on the photograph, the species and all the other species with similar palps. In my personal opinion, it is a major mistake to try and identify most male spiders from photographs of palps, which are usually complex 3-dimensional structures which can look very different at slightly different angles, and where fine details are required for species id. This leaves aside other factors like size, and all the different features required to be sure of what you are actually looking at, such as patterns, eye arrangement, leg spines, trichobothria etc etc. You don't indicate what kind of spider you have, so can't really be more helpful. If you have the spider, by far the best action is to send it to someone who can identify it. You are welcome to send it to me at 32 Lodge Lane, Grays, Essex RM16 2YP. No, I don't think this is Scotophaeus. Most likely Clubiona reclusa, but adult under a microscope is needed. Is it possible for an expert to ID a spider from a photograph of a male palp? I have an idea what it is from Roberts (1995), but he does not figure this species. If so, I will post the photo with details. Roberts is the only reference book I have at present. Incidentally I met Locket in the 1960's when he visited the Hope Dept. in Oxford to study the Pickard Cambridge Collection. A charming man! I was responsible for maintaining the collection, although I am a dipterist. Hi all, new registered user here. I found this spider slowly crawling around a nettle leaf in East Cheshire. After much hunting around to try and ID I believe it is possibly a mouse spider. However, I see from your ID scale that it is perhaps not that easy to recognise. Thanks for any help in identification. Not sure really, need to see the abdomen etc. I can only suggest juvenile or subadult female Euophrys frontalis, see eg. http://www.quickblink.com/euophrys-frontalis-juvenile-p-242.html . Hi Peter. I been out again looking for the lovely Aelurillus v insignitus at Alder hills N/R in Poole but had no luck this time. However i did spot this one and it was the only capture. Could you Id from this. Many Thanks Paul cobb. Hi Peter, 2015 season up and running. Just posted picture of Euophrys herbigrada in East Sussex. will send record shortly. 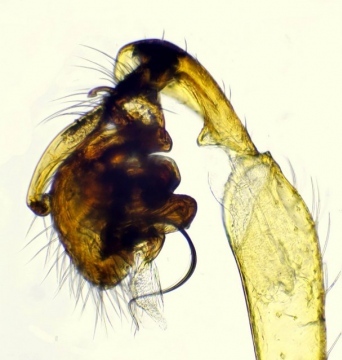 Yes, the pronounced flange on the side of the male palp is visible, so definitely this species. Thanks Peter, I'll keep an eye out for more later in the year. No, not really at all. Firstly it will be juvenile this early, and secondly it could well be T. maritimus. This photo was taken on the 30th of April below Buachaille Etive Mor (NN2395 5419) in an area of blanket bog 250m a.s.l. 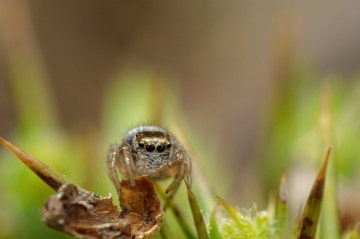 From the habitat and location is it safe to record it as Tibellus oblongus?